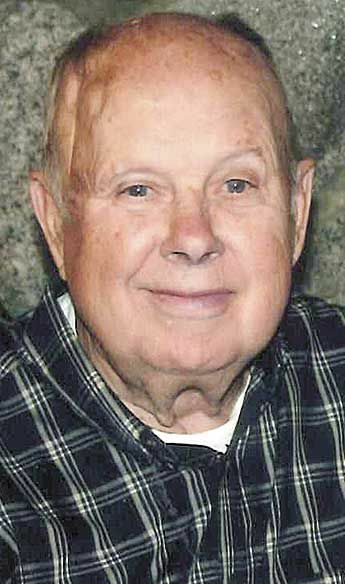 Allan (Bud) Henrichsen of Osceola died surrounded by family on Dec. 12, 2018, at his home. He was 91. Allan was born Oct. 2, 1927 in Park Ridge, Ill., to Albert and Emma (Schlunt) Henrichsen. After graduation, Allan entered the military, enlisting in the U.S. Navy on Aug. 1, 1945. He served in World War II on the USS Leyte, and was honorably discharged on Aug. 31, 1948. Allan worked for Honeywell for 26 years, retiring in 1983. He also started Applewood Farm Nursery in Forest Lake, Minn.
On Jan. 2, 1955, he married Joyce Holteen. They were married for 63 years and their marriage was blessed with five children. Allan enjoyed gardening, sports, coaching and coffee; he especially enjoyed time spent with his children, grandchildren and great-grandchildren. Allan was preceded in death by his parents, Albert and Emma Henrichsen; brother, Russell Henrichsen and sisters, Margaret Henrichsen and Pearl (Wayne) Hamilton. Allan is survived by his wife, Joyce; children, Julie (Philip) Schneider, Laura Henrichsen, James (Robin) Henrichsen, John (Stacy) Henrichsen and Amy (Brian) Fuller; grandchildren, Jennifer (Ragendra) Deoraj, Andrew (Denise) Schneider, Aaron (Colleen) Schneider, Danielle Henrichsen, and Ryan Henrichsen; great-grandchildren, Tanner Brittain, Brayden Brittain, Alice Schneider, Isaac Schneider and Nathan Schneider; nieces Peggy, Marcy and nephew Mike. A funeral service was held Dec. 18 at Shepherd of the Valley Lutheran Church in St. Croix Falls. Arrangements are with the Grandstrand Funeral Home in Osceola. Condolences may be expressed online at www.grandstrandfh.com. Memorials may be directed to Heartland Hospice in Roseville, Minn and the Meditation Garden at St. Luke’s Lutheran Church, in New Richmond, Wis.